Download the printable components for the Printrbot Paste Extruder. Three components in all. Just posted the DXF file for the wood components. 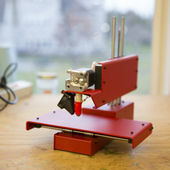 Download the printable components for the Printrbot Paste Extruder. Three components in all. Also posted is the DXF file for cutting the wood components on a laser cutter. Check back in for improvements on the BETA design.